ECES cooperates with several donor organisations in order to implement its many projects. The European Union (EU) and EU Member States are, by far, the predominant donors and collaborators. Overall, ECES has collaborated with, and been funded by, more than 20 different donors (access the following link for detailed information about ECES’ funding partners). Being the EU one of the most important ECES interlocutors, and because of the shared overarching value of transparency and accountability, our organisation is part of the EU transparency register, an initiative designed to make EU decision-making more open. The register is managed by the 'Joint Transparency Register Secretariat (JTRS)' comprising staff from Parliament and the Commission. This transparency register is a public website where organisations representing particular interests at EU level register and up-to-date information about those interests. The EU transparency register also provide open information on what interests are being represented at EU level, who represent such interest and the related budget to lobby activities. Within this context, ECES endorsed the Code of Conduct governing relations of interest representatives with the EU institutions. In order to provide a global overview of our organisation, the pie chart below summarizes ECES’ sources of funding. It shows that 83% of ECES’ funding comes from the European Union, with an additional 9,51% coming from EU Member States, for a total of 92,51%. The remaining funding comes from other donors and partners. The figure confirms the habit of ECES to collaborate with the EU since 2012 and the consequent mainstream of EU’s procedures in ECES’ activities. Since the beginning of its activities, ECES has signed more than 70 contracts in support of electoral and democratic process. In this context, the second pie here below, classifies ECES’ Funding partners by number of contracts signed. 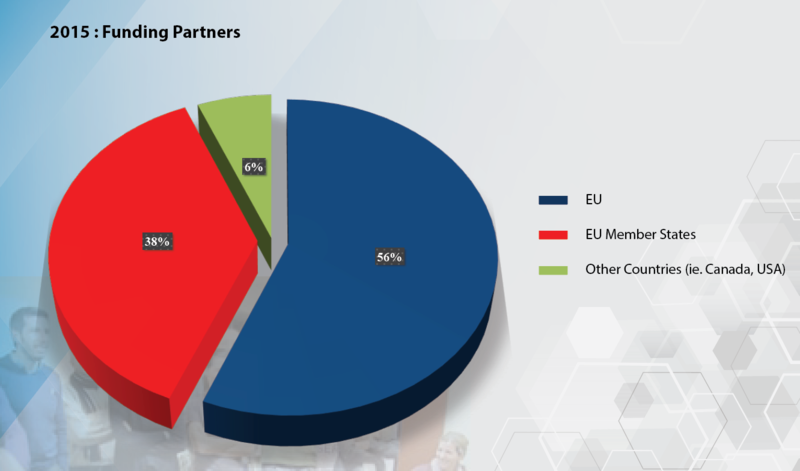 Also in this case, the pie chart show that the EU is the main ECES’ funding partner, directly followed by EU Member States. Given the size reached by our organisation, ECES’ annual accounts, after being externally audited twice a year, are submitted to and published by the National Bank of Belgium (ECES Business number 829998514). ECES’ accounts of 2011, 2012, 2013 2014, 2015 and 2016 have been audited and submitted while the ones of 2017 are on the process of being ­ finalised and will be audited in the ­first quarter of 2018, in accordance with the standard calendar of Belgian authorities. As ECES strongly believes in streamlining the overarching principle of transparency throughout its work, here below the consolidated figures of the 2015 Financial Accounts. With regards to 2015, the pie chart below summarises the origin of the contributions received by ECES during the year for the implementation of its projects. The figure confirms the consolidated trend of EU funds’ prevalence not its exclusivity.